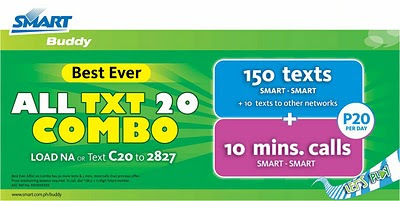 SMART BUDDY'S BEST EVER ALL TXT 20 COMBO! Get more texts and calls for the same price of P20/day! Package validity is 1 day..
Enhancement shall be effective starting October 15, 2010 and shall continue to be a permanent service. 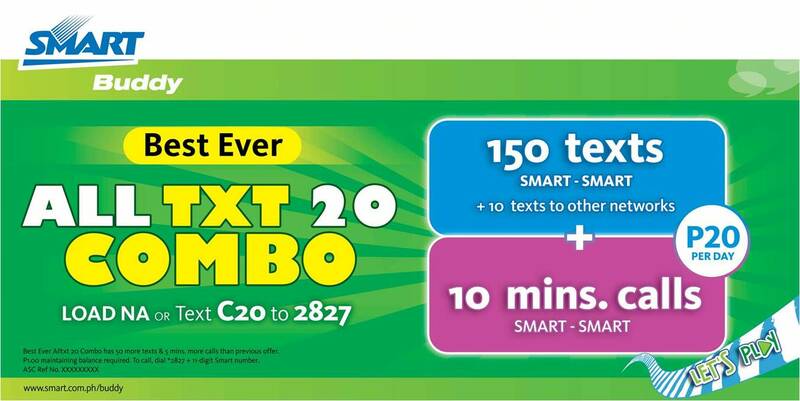 SMART BUDDY'S BEST EVER ALL TXT 20 COMBO!Get more texts and calls for the same price of P20/day! bwisit, ninakaw un free call q, check op agad aq? ive loaded Text & Call Combo this night. when i received the Smartload i thought i will be having my free call when unfortunately it didn't says here any infos what to dial when i will call. is this a scam Smartload? hey! It appears that a lot of people are having problems with this promo. Ill add an information for the meantime while Smart sorts this one out. I suggest you guys to report this to smart.